Thread: Christmas 2017, whats your car getting? So what are you getting your car for Christmas? Mine isn't getting anything new, except maybe an engine diaper since the tracks seem to be requiring it these days. I've already bought a new ignition kit this year, new nitrous plate, new tires, and a few extra nitrous bottles. I just haven't made it to the track but once in 2017 and had issues that time. Hoping to finish a couple things, install a diaper, and start going to more events in 2018. Wow, the board really is this dead, 5 days with no responses! I got a small drone for shooting aerial videos, a Yuneec Breeze. Seems to do great for just videoing. Its not fast but it is smooth and has good quality. 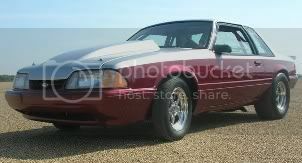 I bought a old 2.3T to eventually swap into my fox body I keep around for the kids. Outside not really anything for the Mustangs in my house. Probably will start on my FE powered truck project but did not actually buy any more parts for it. Still need to make a decision on if I am going to get the 360 rebuilt via a stroker kit and if so who I would use for that task OR if I will just use one of the very mildly built 360s I have access to for basically free. Nothing new for the car, at least not for the holidays. Finally got everything together with the new setup and hoping to get some real seat time this year. Baytown may not reopen til March it seems. May be doing Ennis in Jan or Feb if I get the itch and can't wait til March. We'll see... Loving the new enclosed tho!